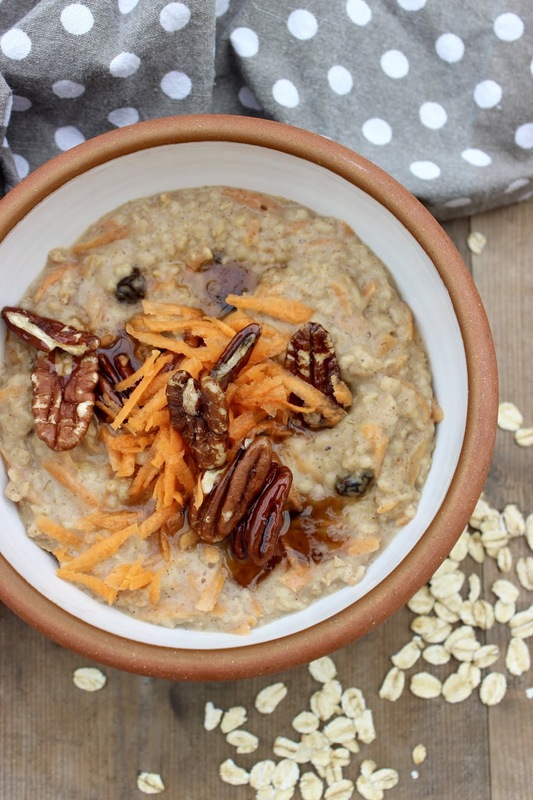 It's been a while since I shared a porridge recipe- not least because we've been blessed with a scorcher of a summer so my breakfasts haven't revolved around this warming dish in the way that they tend to in the cooler months. My mum always starts her day with porridge topped with raisins and nutmeg because, having spent a lot of time in the Caribbean, she's a strong believer in the spice's powers- which include anti-inflammatory properties. Today's porridge recipe incorporates both raisins and a little nutmeg but takes things to the next level in a breakfast which is reminiscent of cake/ dessert. It's still good for you, with at least one vegetable portion (more if you increase the raisins slightly), protein rich nuts and, of course, oats which boast lots of benefits. I can't wait for you to try out this recipe! It really captures that classic carrot cake flavour and is such an indulgent way to start the day! 1) To make the porridge, combine the oats and almond milk in a small saucepan and cook over a medium heat on the hob, stirring regularly. 2) When the porridge comes up to a simmer, add most of the grated carrot (keeping back a pinch or two for the topping) along with the spices: cinnamon, ginger and nutmeg. Stir to combine. Continue to cook until the mixture has thickened and most of the liquid has been absorbed, approximately 5- 10 minutes. Stir in the raisins. 3) Meanwhile, make the caramelised pecans by placing the nuts in a small frying pan along with the maple syrup over a medium heat on the hob. Bring up to a boil and cook for a couple of minutes to caramelise, taking care not to burn. 4) Pour the porridge into a bowl and top with the caramelised nuts (& any remaining maple syrup from the pan) and the remaining grated carrot. Enjoy immediately.